Wetworks pits players against each other in the role of opposing tactical mercenaries attempting to eliminate enemies. Get your "hands" dirty with the Wetworks card game. Each player manages a hand of 7 cards, trying to collect matching suits of cards to eliminate the enemy where he stands. Watch out, though, players may also play movement cards to advance the Targets along their movement tracks. Taking a Target out of one zone, into the next, and out of your reach! Targets can gain Bonuses, making them tougher to eliminate. Beware the Compromised card which other players can use to spoil an attempt on a Target. There is always the possibility of the Double Agent lurking in the deck. 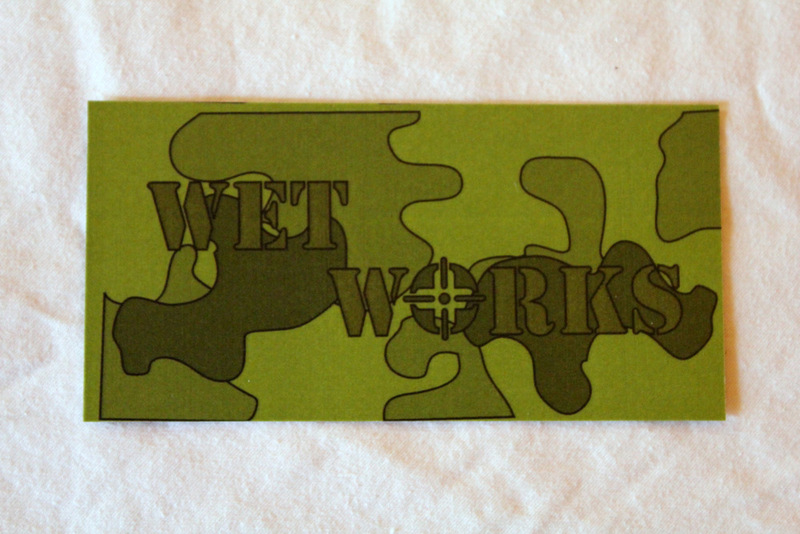 Wetworks is a suit matching card game built around the theme of a covert operation to eliminate an enemy Target or Targets. The game play is derivative of Rummy or Poker type games, matching suits to get a winning hand. The object of the game is to be the Player with the most reward points at the end of the game. Players receive points for eliminating the Primary or Secondary Target before they move off the board onto the “Exit” (X) space. Wetworks can be played for a single round, using only one location and one board with the winner being the Player with the most money/points at the end of the round, or it may be played over several rounds using some or all of the Locations, using cumulitive totals to determine the winner. This lends variability to the length of the game time, and to the difficulty of the game as each track layout on the boards is different.